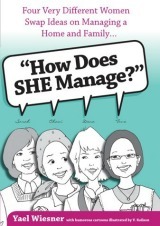 I have just finished reading the wonderful newly-released book How Does SHE Manage: Four Very Different Women Swap Ideas on Managing Home and Family (Feldheim) by Yael Wiesner. The truth is that I usually try to avoid home organization books since they generally cause me to hyperventilate and beat myself up for my near total lack of domestic prowess, but what I loved about this book is that it contains insights also from mothers who are on my end of the domestic spectrum. What I mean is that, like most organization books, this book contains ideas from a hyper-organized SAHM as well as a working mother who strives to have her home run as smoothly as her company, but the book also includes the insights of two mothers who are more on the swimming-in-unfolded-laundry, laid-back side of the spectrum–like me. Tova: I’ve trained myself to become a balanced giver—to take care of myself so that I can give a lot of myself. When I learned to do this properly, I became a much happier person and a better wife and mother. Chani: Vitamins, not coffee, are key for me. I find that women rarely have the energy they need for all the things they need to do, especially during their childbearing years. Vitamin B-complex and Omega3, which I take on a regular basis, keep me from feeling run down and tired. Taking these vitamins has changed the quality of my life entirely and I sincerely recommend them to all the busy and tired women. I also take a multi-vitamin when I’m pregnant and nursing to make sure that my own body stays stocked with what it needs. Whenever I’m lazy and stop taking my vitamins, I really feel the difference. Sarah: …I speak all day with Hashem, constantly asking for help with every little detail. These little prayers all day long are my main way of recharging. When the baby is screaming, the kids are fighting, the house is a mess and I can hardly get dinner from the freezer to the microwave, I try to ask myself, “What is Hashem’s will right now?” What would Hashem like me to handle first? This allows me to slowly and steadily deal with whatever situation is before me until everything is taken care of. Making proper decisions with Hashem in mind gets me through the day. Dena: I try very hard to find the time to daven Minchah as often as I can. It doesn’t take me so long and I feel it is my special connection to Hashem during the day. Sara: I also keep certain key phrases or quotes in my mind that I have collected from different role models over the years. “There are a million and one ways to be a good mother,” (Rebbetzin Altusky) and “I can only put in the effort, but the success is in the hands of Hashem,” and “I am only human.” Tova, I’ve added your phrase to my list: “A home has to be clean enough to be healthy, but messy enough to be happy!” The list goes on and on. Sometimes I write these quotes down and hang them on my refrigerator as reminders. Talking to myself and being my own source of encouragement has worked very successfully for me. Join our #1 Weekly Newsletter and Receive a Free Gift!